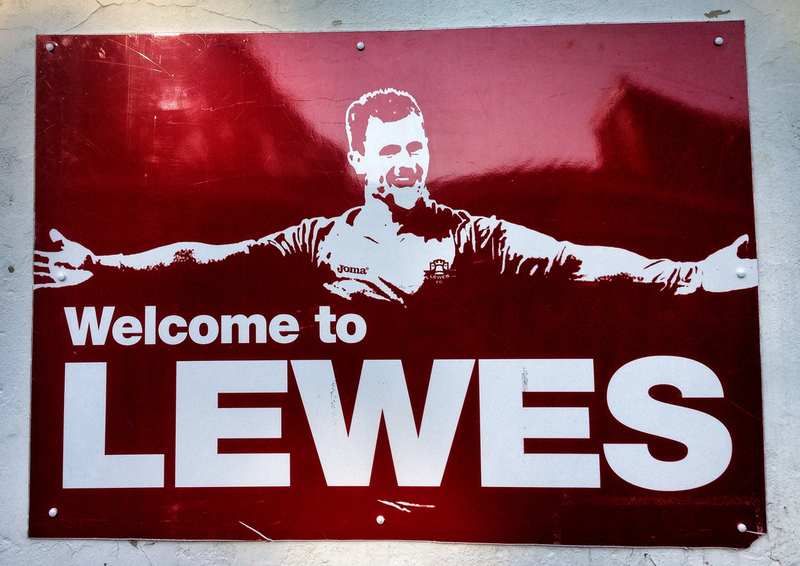 “Welcome to Lewes”, sparkles the sign in the early evening sunshine as you enter the Dripping Pan these days. An iconic image of fans-favourite Nathan Crabb, arms outstretched, tempting you to hug the very fabric of this historic ground. It has been a long three months since we waved goodbye to the first team squad after a last-minute defeat to Bury Town and we held onto our Ryman Premier League place by our fingertips. A week is a long time in football; a close season is a millennium. Since that fine April afternoon we have a new manager, new assistant manager, new coach, new physio, new kit-man and a new squad. As is the like in non-league football, players come and go every season but under our new manager, Garry Wilson, we have assembled what many believe to be is a “cracking little squad”. It has always been the dream of the club to have a squad of local players and for the first time in living memory, we have just that, with every player currently living in East Sussex. All the signs are pointing towards a season of optimism, rather than pessimism. Well, that is if we actually have a season at all. Tonight’s friendly against Ryman South neighbours Eastbourne Town could be one of a long string of non-competitive games The Rooks play over the next few months. Whilst the Premier League fans have been planning their away trips for nearly four weeks, and the Conference boys have already sorted arrangements for Christmas, us poor relations in the Ryman League could be waiting for a long time yet. Officially, fixtures are set, but events on the other side of the Dartford Tunnel could put them all on hold. You must have been living in a non-league-free cave for the past few months to have not heard about the “Thurrock issue”. In a nutshell, the situation is as follows:- “Man plays for Sunday League side, gets sent off and fined £16. He goes off to Play-Off Final to watch Huddersfield Town, gets knicked and subsequently set to prison. On his release he travels south and plays for Thurrock against Lewes, before moving onto Tilbury.” However, what he didn’t know was that his Sunday League side had folded and not paid his £16 fine. Nine months after that game against Lewes, the FA decide to punish Thurrock for playing him by deducting them 3 points. Unfortunately, those 3 points mean that Thurrock are relegated at the expense of Carshalton Athletic. They appeal (quite rightly) but both the Ryman League and the FA deem they are guilty. So Thurrock are now taking the case to the highest level in the UK which is an FA chaired arbitration panel. There had been rumours that sporting court in Europe, the Court of Arbitration for Sport in Lausanne. Which may mean the season may not start in three weeks time. Clubs have already formalised their budgets, reliant on the income that competitive fixtures from mid August will bring. So if this case does go ahead, how many clubs simply will not be able to financially cope? The whole saga was/is an avoidable mess. But back to tonight when the sun is shining, the pitch looks in perfect nick and everyone in the crowd, including Dave, has forgotten where their cynical streak is. This game will complete a trio of home games against the sides from Eastbourne in the past twelve months. A win against Borough in last season’s pre-season was tempered by a disastrous defeat to Sussex County League Two side United in the Sussex Senior Cup. So who knows what would happen in the next 90 minutes. To add a further element of intrigue to proceedings, the new management team of Wilson and Bloor would be making their home debut against the club they left back in May. First up was a programme editors meeting with Bazza Collins. Apparently it was the norm for such high powered editorial meetings to take place in J.D Wetherspoon establishments, or so Barry, the experienced periodical editor led me to believe. Then it was the train down to Lewes, high fiving jealous commuters all the way along the carriage before meeting up with all those long-lost friends. “How have you been?”, “What have you been up to?”, “What’s news?”. Conversations that you have on auto-pilot, readying yourself for that first tackle, the first corner, and the first Rooks goal. 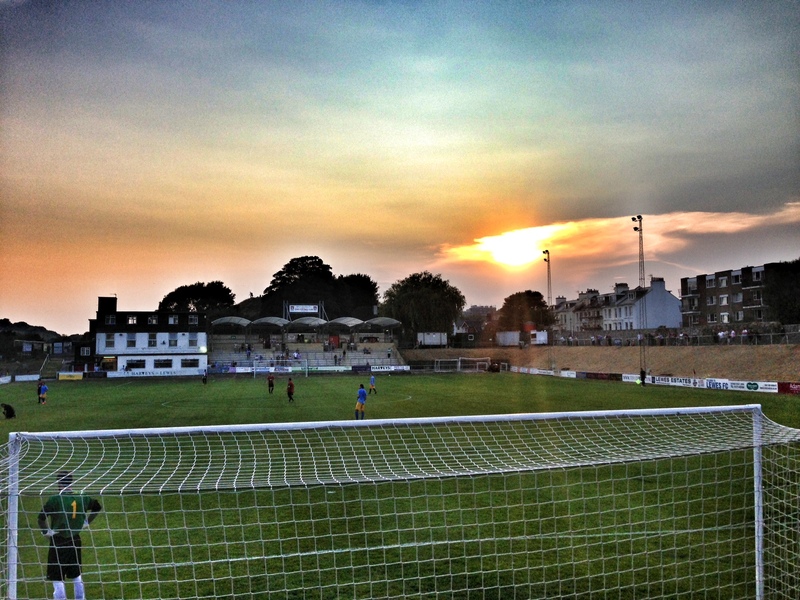 Lewes 2 Eastbourne Town 2 – The Dripping Pan – Wednesday 17th July 2013 As I never tire of saying, it is all about the performance and not the result. That said, for 89 minutes of this first run out for the new look Rooks team could have had both. In fact, they should’ve had both but two Eastbourne goals in the space of 30 seconds gave the visitors a share of the spoils on a baking hot evening in East Sussex. A pretty good crowd of 330 watched events unfolding both on the pitch as well as behind it where the grassy tranquil meadow of the Convent field was being converted into a venue fit for gentlemen…Mumford and Sons to be precise who will be “rocking” Lewes this weekend. Optimism the latest drug on the grassy knoll. Players warmed up in the sunshine as the fans tried to put names to faces of the new players. New manager Wilson had stated his aim to use all of his current squad of 20, with the stand-in keeper Gerard being the only man guaranteed a full 90 minute run. Even Cynical Dave offered to buy a round at the bar. A lack of football and sunshine does funny things to people. Despite almost falling behind early in the game, Lewes took the lead in the 25th minute, depriving Big Deaksy of a winning golden goal ticket. Last season’s youth-team captain Kelvin Brown was the scorer, as he met a Ryan Fergany corner to send a powerful header past Greg Nessling in the Eastbourne Town goal. Lewes doubled their lead before the break when a great run and cross from centre-forward come right-back Sam Crabb was not dealt with by the Town defence, allowing Fergany to pick up the loose ball and send a low cross along the six-yard box which Dan Smith converted at the near post. Lewes started the second half well, with the lively Nathan Crabb and Austin both having efforts well saved by Nessling in the opening ten minutes of the half. Matt Crabb was having a fine debut, so good in fact that I immediately stumped up my annual TBIR player sponsorship budget there and then on the midfield maestro. However, Town stepped up a gear after the changes at half-time though, and pulled a goal back just before the hour when Alex Howell latched onto a short back pass and poked the ball Gerard’s legs from close range. Less than a minute later, Eastbourne were level when former Lewes winger Watson found space down the right and sent in an excellent low cross which Tony Reid converted at the far post. Both sides had opportunities during the last half an hour, with Matt Carruthers and Reid going close for the visitors and two of the stand-out players of the second half – Ross Treleaven and Matt Crabb – almost scoring a winner for the Rooks. But it was not to be…Performance 8/10, Result 5/10….but it is very early days. The smiley, happy faces were still enjoying a beer on the terrace 30 minutes after the final whistle. 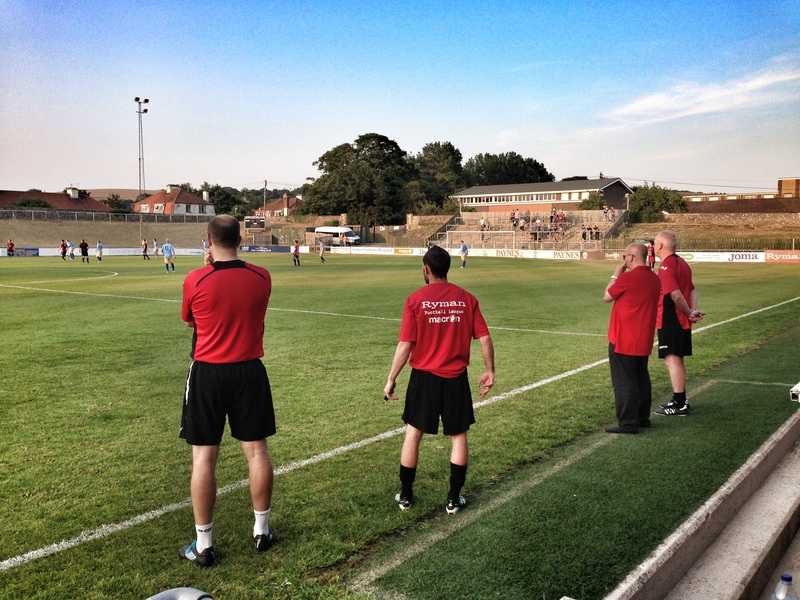 The return of football had been the winner on a wonderful East Sussex evening. Roll on the real action.